In 1998 I began writing and arranging some songs on guitar. One of these was a bluesy lament entitled Absent Friends, dedicated to the late friends and musicians I have known. After sax player Ian Caple died in May 1998, I did a performance of this song at his wake, featuring David Bickley on keyboards. This song formed part of the set for a new three-piece band I began working with - Don Miucci on bass and Pete Mathias on drums, using the name Vibe Warriors. 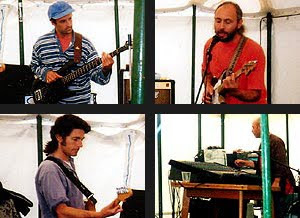 We played one gig at the end of June 98 and were billed to play the St Just music festival Lafrowda Day in July but had to cancel when Pete urgently had to move back to Wales. We did play one other booking for this year, at an outdoor event in Peterchurch, Herefordshire in August, with Steve Dyer on guitar and John Bland on keyboards and sampler. We used a Drumatix to provide rhythms. Don and I continued to seek another drummer for some time, then considered working as a duo. Many local pubs were by now promoting live music and two musicians was the maximum number permitted at these small venues.